Botanical Name: 1. Melia azedarach L; 2. Melia toosendan Sieb, et zucc. Part Used & Method for Pharmaceutical Preparations: The bark is collected in spring or autumn. After drying, the bark is cut into slices. Meridians: Spleen, stomach and liver. 1. Roundworm (ascariasis). Chinaberry bark (Kulianpi) is used alone. 2. Hookworm (ancylostoma). Chinaberry bark (Kulianpi) is used with Areca seed (Binglang). 3. Pinworm (enterobius vermicularis). 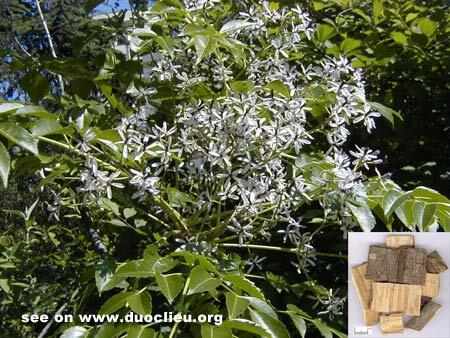 Chinaberry bark (Kulianpi) is used with Stemona root (Baibu) and Black plum (Wumei). The thick decoction can be taken as an enema to wash intestines once every night. Treatment should be continued for two to four times. Cautions & Contraindications: This herb is toxic and should not be taken for a prolonged period. It is contraindicated for a person with a weak constitution or with a liver disorder.